"See, it cries, wets itself and has very realistic choking sounds." "David, it's still your turn to clear the table. Pinching your sister's dolly won't work any more, she is forty-one now." And Dave went on to fail his first aid course. His colleague is a boom boy, but Pete is a dolly grip. "That's Dave, always playing the choker." "I attended the Michael Jackson School of Parenting"
"Jack's comments were NOT funny, especially his 'inFANT asides.' "
He's thinking of a dollywood. "For goodness sake woman, if I have to tell you again...she wants to give her dad a gottol of geer!" "So bruv, when you said you spent last night with some gorgeous doll, wanna talk about it?" 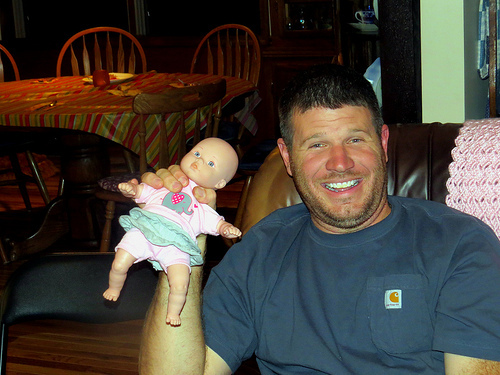 The World Baby Tossing Champion proudly displays his trophy. An example of why professional wrestlers shouldn't be allowed to procreate. "Say you like my new veneers, or the dolly gets it." "No Gary, that's not how you hold them. Can you please stop playing Angry Birds during Antenatal class and pay attention"